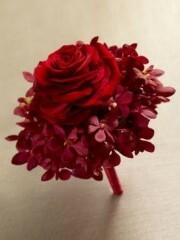 The Ruby Glow Bouquet is bursting with rich sunlit hues to bring a happy elegance to your wedding day. 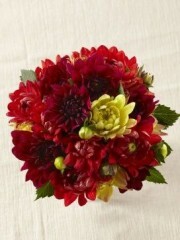 Red, burgundy, and yellow dahlias are brought together to form a fantastic bouquet, tied together at the stems with a hunter green ribbon, giving you a "fresh from the garden" look. Approx. 10-inches in diameter. 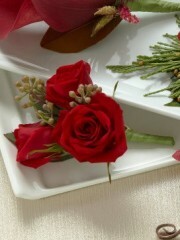 This fresh rose buttonhole in rich scarlet is presented with delicate asparagus fern to add contrast and detail to these stunning flowers. 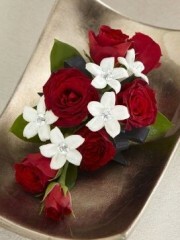 Roses are a traditonal favourite for buttonholes, and a popular choice for many bridal couples. Every bride needs a magnificent bouquet and this crimson and white shower bouquet of gerberas and orchids is a wonderfully grand statement. 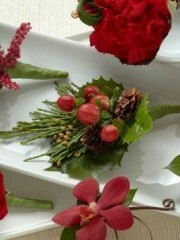 The bright crimson works beautifully with purest white. 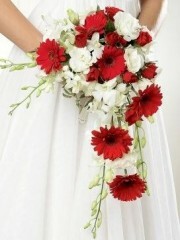 This is contemporary styled bridal bouquet that is guaranteed to make an impression. The Desire Bouquet looks like it stepped straight out of a fairytale dream. 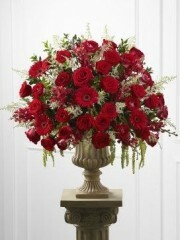 Classic red roses have been brought together to create one large composite rose sitting in the center of a circle of red mokara orchids and presented in a straight handled red bouquet holder for the ultimate bridal look. Approx. 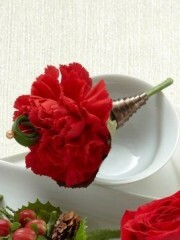 10"H x 10"W.
This Red Carnation Boutonniere has a classic look that will add that extra touch to your wedding day style. 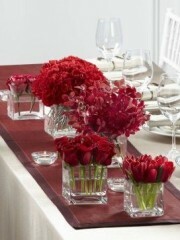 A single red carnation is accented with lily grass blades and lush greens for an eye-catching appearance you will love. Approx. 4"H x 3"W.
The Regency Centerpiece is a fantastic display of blooming elegance to give your wedding guests an impression that will last a lifetime. 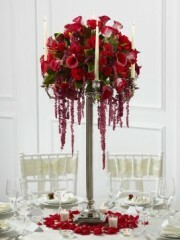 Red roses, spray roses, mini calla lilies, hanging amaranthus and bi-colored red and white roses are arranged to perfection and situated within a silver candelabra holding four white taper candles. 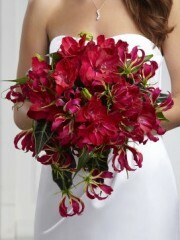 The Red Calla Lily Boutonniere is a sophisticated touch that will have the men in your wedding party looking their best. 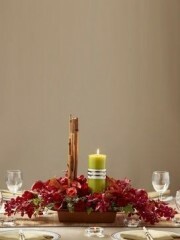 A single red mini calla lily is accented with red hanging amaranthus and lush greens to give them a distinguished style. Approx. 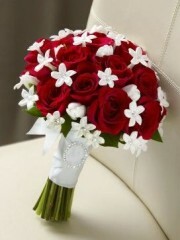 5"H x 3"W.
With a look of pure elegance and charm, this pretty bouquet will ensure you look your bridal best. Red roses are accented with white tulips and white stephanotis blooms beautifully tied together with a white French taffeta ribbon to give you an appearance that only poetry could describe. Approx. 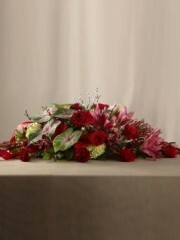 13"H x 10"W.
The passionate reds collection is a lovely selection of vibrant bouquets and arrangements offered by Edinburgh flowers. The flowers required for a wedding ceremony and reception can be split up into two categories which are those partaking and the venue which this wedding flowers collection covers thoroughly. Asides from the bride and groom, there are others who take part in the ceremony including the bridesmaids; groomsmen; the maid of honour; the best man; the flower girl; the ring boy as well as the parents of the happy couple and others. Most of these people require flowers of some sort which is where Edinburgh flowers step in. For the bride, there are several things which need to be considered such as what bridal bouquet she would like as well as perhaps flowers to wear like a floral hair comb or decorations for the bridal veil. On the bride’s side of the ceremony, the bridesmaids also all have a lovely bouquet and these can be arranged to contrast or complement the bride’s bouquet. 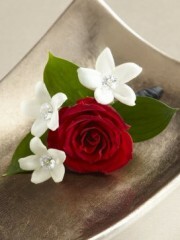 The bridesmaids and maid of honour might also like to wear a lovely corsage to finish off their outfits. Edinburgh flowers have a lovely selection of corsages on offer with flowers such as the roses and contrasting white stephanotis. 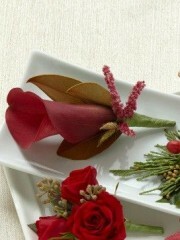 The flower girl scatters lovely flower petals for the bride but the petals must be fresh and pretty to look at. On the groom’s side of the wedding, the groomsmen and best man can all have matching or contrastingly complementary buttonholes, highlighted by their sharp suits. In addition to the people attending the wedding, the venue must also be considered as, for example, the reception tables might require floral centrepieces and so on. There are a lot of designs and arrangements which must be considered and Edinburgh flowers want nothing more other than to help you choose the perfect wedding flowers for this special day. 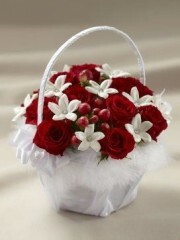 All the flowers the Edinburgh florists work with have been imported all the way from the prosperous fields of Holland. Holland is the western region of the Netherlands renowned worldwide for the premium quality of flowers cultivated there so you can be assured in the knowledge that Edinburgh flowers provide customers with nothing but the best quality. The quality of a flower directly affects the freshness so a good quality also means that your flowers will stay fresh throughout the wedding day as well as for many days to come after that. The Edinburgh florists have over forty years of experience in the floristry industry under their belts which means they have catered for a huge number of weddings so you know that your order has been placed into capable hands. The Dutch cultivators provide the florists with a huge selection of red flowers including traditional roses; pretty dahlias; calla lilies; gloriosa lilies and gladiolus amongst many others go towards the arrangement of the passionate reds collection. The florists expertly shape perfectly rounded bouquets where the flowers are placed in lush foliage and little ornaments such as ivory peals and then wrapped up in complementary ribbons. 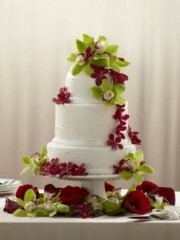 The floral arrangements come in a variety of shapes and sizes but are also expertly arranged. If you have any further queries about any of the services provided by Edinburgh flowers or wish to book a consultation, please do not hesitate and get in touch. You are able to either send the shop an email or call directly as there is always someone available to answer any and all of your questions.